Over the course of 2016, American iPhone owners forked out an average of $40 on iOS App Store purchases, including in-app transactions —up from $35 in 2015, according to new analytics data. 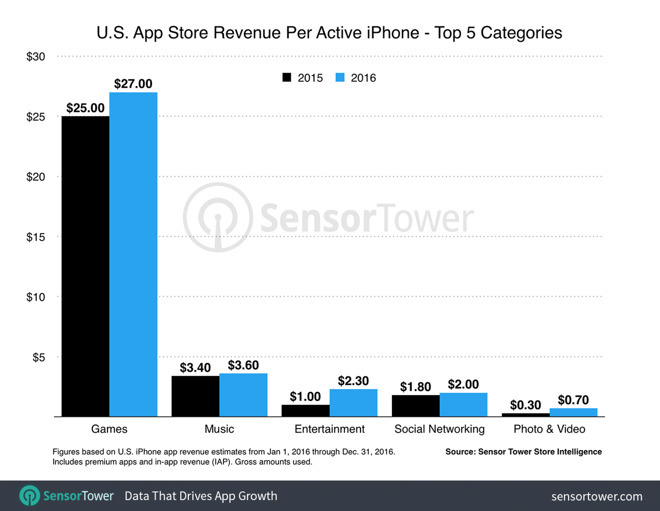 Spending in the "Entertainment" category was also up from an average of $1 in 2015 to $2.30. This is thought to be linked to the popularity of video services like Netflix, Hulu, and HBO Now — Netflix's contribution to revenue amounted to $58 million during the December quarter alone.